Dr. Chander MD & His Experienced Team of Medical Specialists Provide Allergy & Asthma Treatment Near You. Get the Relief You Need Today! 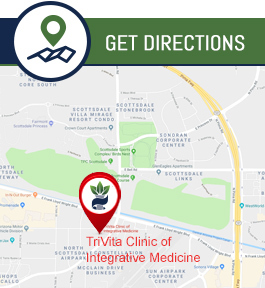 TriVita Clinic of Integrative Medicine Is Located at 16100 North, Greenway Hayden Loop, Suite G-100, Scottsdale, AZ 85260. Please Give Us a Call at (480) 725-4474 or Request an Appointment Online. When you are congested, or can’t breathe, it makes you miserable. When it comes to asthma and allergies, TriVita Clinic of Integrative Medicine has the expertise necessary to diagnose and treat your worst symptoms. We believe in taking a whole-body approach to the treatment of your allergies and asthma, and strive to provide fully personalized treatment and care to each of our patients. While over-the-counter medications such as anti-histamines may provide temporary relief for your symptoms, the expert medical team at TriVita Clinic is committed to finding long lasting solutions for your allergy and asthma symptoms. Whether you are coming to us for an initial consultation and diagnosis, or you are returning to receive comprehensive treatment, we want you to feel comfortable and welcome. Our entire professional medical staff is committed to providing high quality allergy and asthma diagnosis and treatment in a calm and relaxing environment. The most important part of finding effective relief from your allergy symptoms is to diagnose the exact things you are allergic to. At TriVita Clinic of Integrative Medicine, we offer skin prick tests to provide comprehensive diagnosis of your food and airborne allergies. A skin prick test consists of having allergens gently scratched into the uppermost layer of skin on the back. Positive allergens will cause an obvious response in about 30 minutes’ time. Once these results can be reviewed, your doctor will take time to discuss all potential treatment options with you. At TriVita Clinic, we are dedicated to providing relief for your allergy symptoms, so you can enjoy your life indoors and outdoors all year long. We offer a full range of services to help you take control of your allergies. We are proud to offer immunotherapy services for our patients suffering from allergies. It is a cost-effective and convenient treatment option that can lead to long-lasting relief of allergy symptoms even after your treatment has been stopped. Allergens are made into low dose prescriptive serums which are then taking daily to improve your immune response to those allergens. This treatment method is clinically proven to change the underlying allergic disease, which is why it is an effective method for achieving lasting results and relief from your symptoms. The diagnosis of asthma will require a full medical history and a physical exam. You may also be required to perform a lung function test, as well as a chest or sinus x-ray. Once asthma has been diagnosed, there are many different treatment methods including the administration of steroids and other anti-inflammatory drugs. You may also want to discuss inhaler and nebulizer options with your physician to decide if one or both are right for you. At TriVita Clinic, we are fully dedicated to your health and well-being. If you are having difficulty breathing or are suffering from allergy symptoms, do not wait, call TriVita Clinic of Integrative Medicine today to schedule an appointment. We value your time and are proud to offer the highest quality diagnosis and treatment of allergy and asthma symptoms in the Scottsdale area. We accept most major health plans including Medicare, AETNA, Blue Creoo Blue Shield, CIGNA, Humana, United Health Care and many more.